Follow the step-by-step journey of your cup of coffee from planting to brewing! 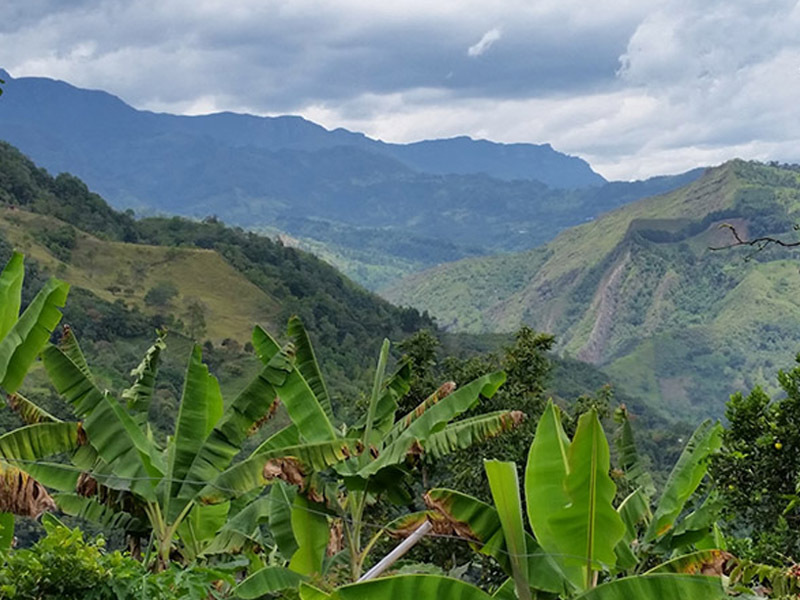 1 - Finca La Despensa is located at 6,000 feet above sea level in the Andes Mountains of Colombia, South America. 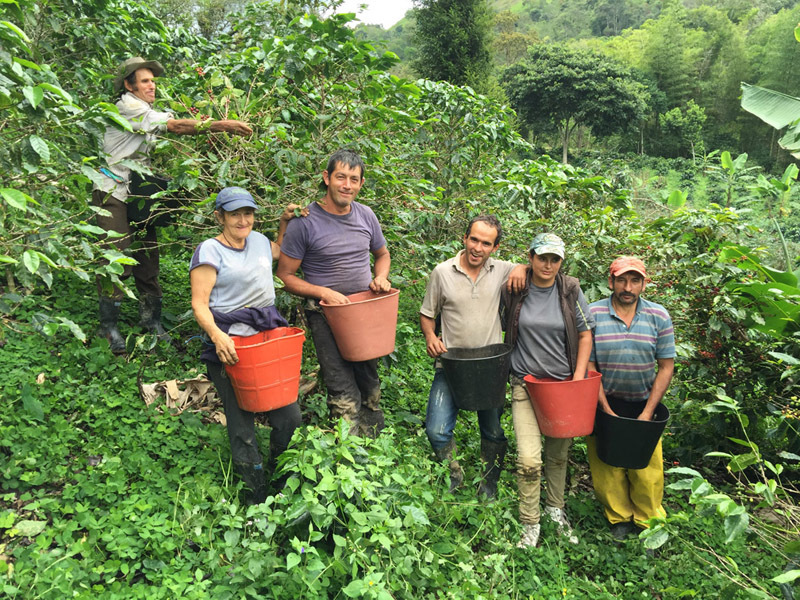 2 - Finca La Despensa currently maintains 6,500 Arabica coffee trees of the Colombia and Castillo variety. 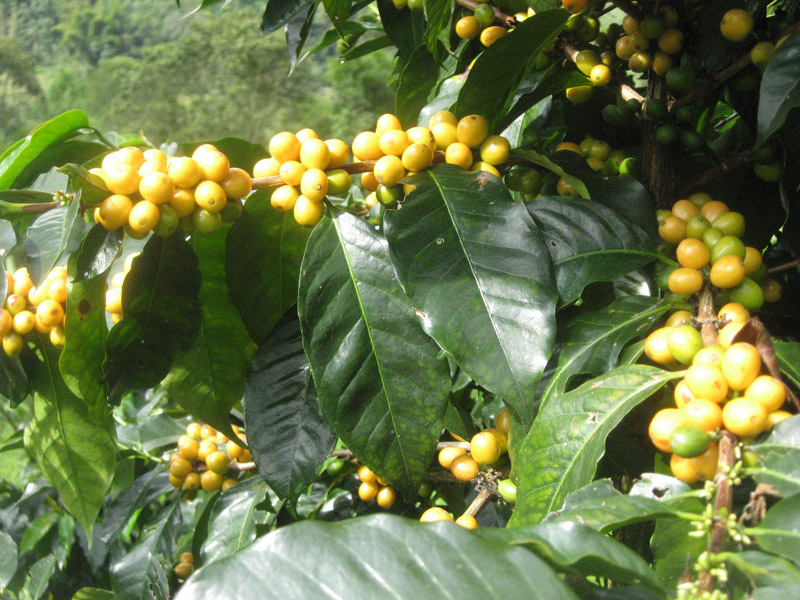 3 - The fruit called the coffee cherry turns a bright yellow or deep red when it is ripe and ready to be harvested. 4 - In Colombia, there are two flowerings annually: a main harvest in May/June and secondary harvest toward the end of each year. 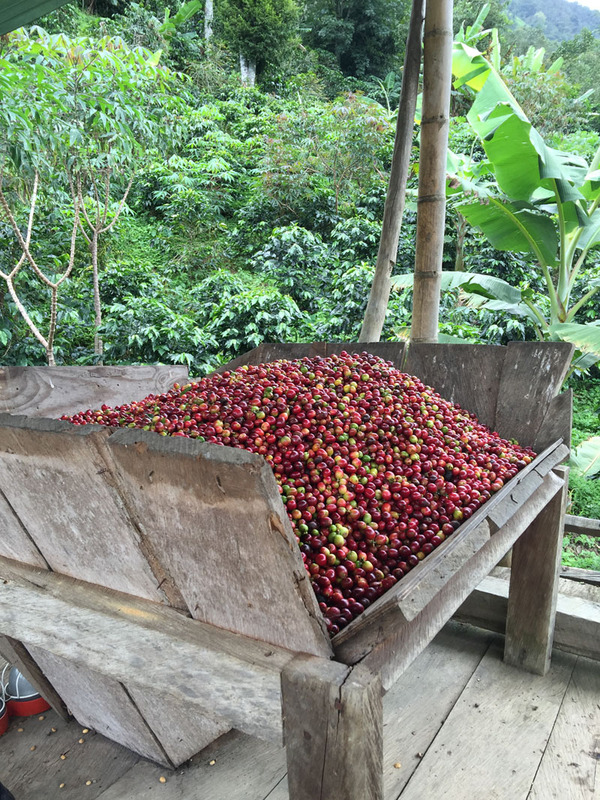 5 - All our coffee is selectively picked, which means only the ripe cherries are harvested individually by hand. Pickers rotate among the trees every 7 to 14 days, choosing only the cherries which are ripe. 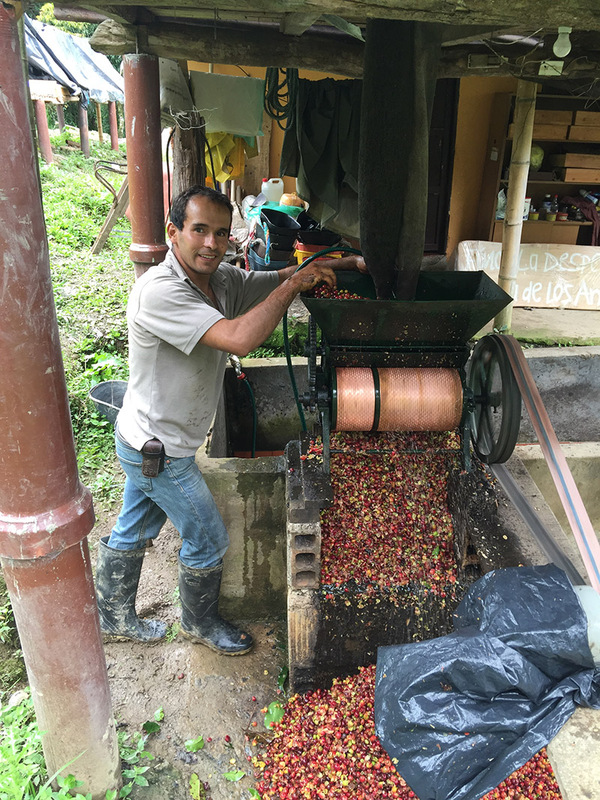 6 - On any given day at Finca La Despensa during harvest time, you will find 3 to 6 local farmers assisting in the coffee harvest. 7 - A good picker averages approximately 160 to 240 pounds of coffee cherries a day, which will produce 32 to 48 pounds of green coffee beans. 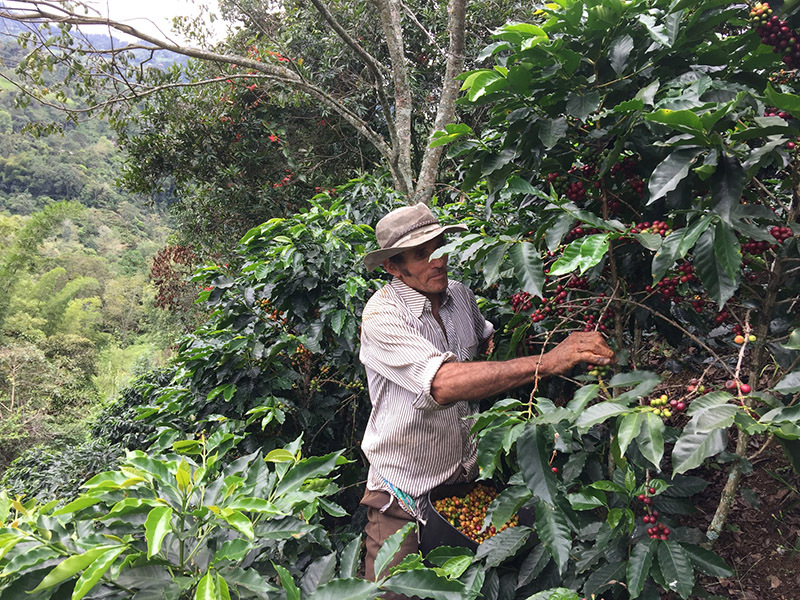 At Finca La Despensa, each worker is paid a daily wage for his or her work. 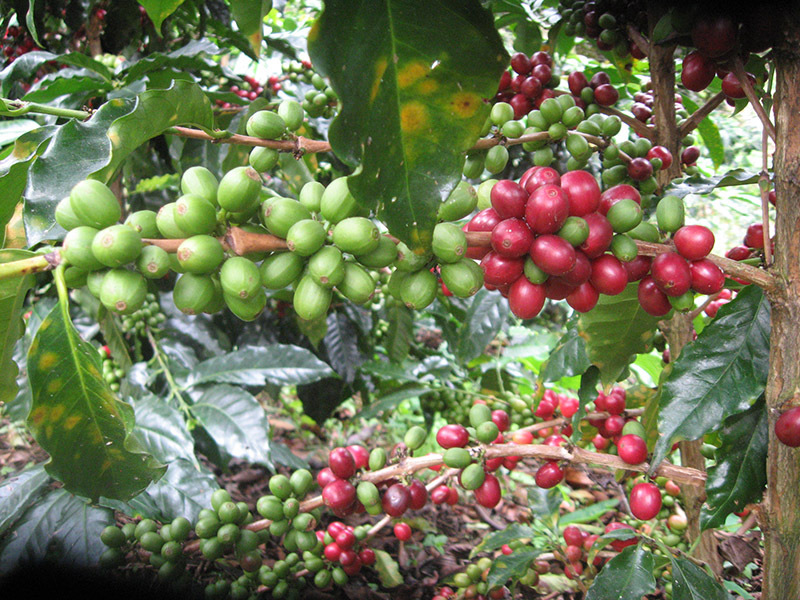 8 - Once the coffee has been picked, processing must begin as quickly as possible to prevent fruit spoilage. 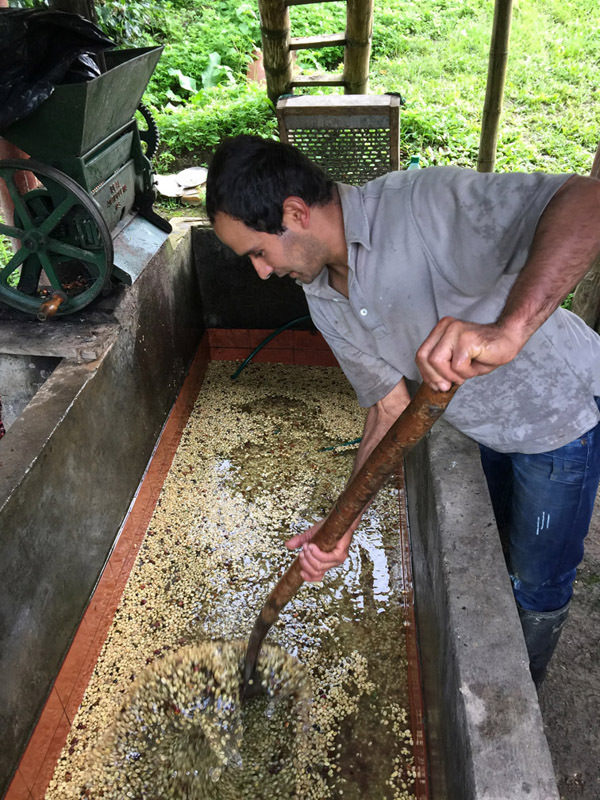 At Finca La Despensa, we use the wet method of processing our coffee. The freshly harvested cherries are passed through a pulping machine to separate the skin and pulp from the bean so the bean is dried with only the parchment skin left on. 9 - After separation, the beans are stored in a water-filled fermentation tank where they will remain in these tanks for approximately 12 hours. While in the tanks, naturally occurring enzymes will cause the outer layer to dissolve. During this process, the lighter beans float to the top, while the heavier beans sink to the bottom. The lighter beans are considered second grade “pasilla” and are removed. The remaining beans are then rinsed several times, and are ready for drying. 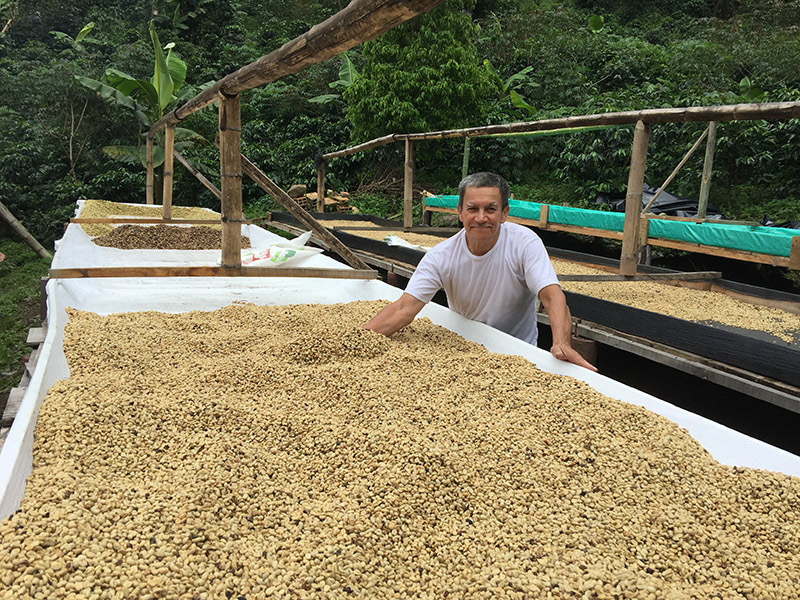 10 - The pulped and fermented beans must now be dried to approximately 11% moisture to properly prepare them for storage. This takes an average of 21 days depending on weather conditions. 11 - The beans are sun-dried by spreading them on drying tables, where they are turned regularly. 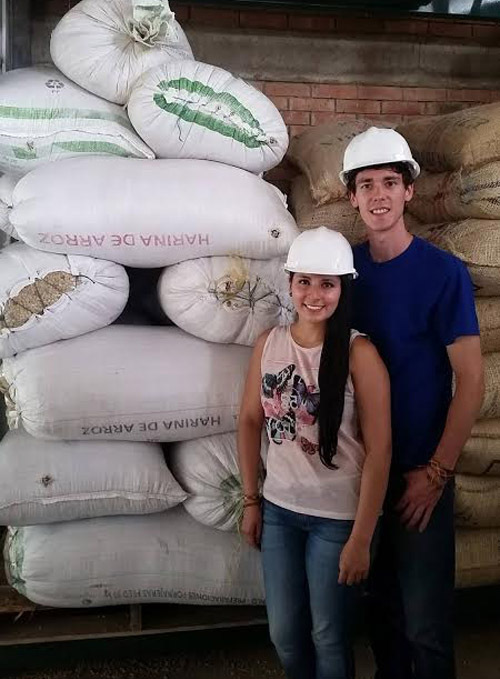 The dried beans are known as parchment coffee, and are stored in jute bags until they are ready for milling. 12 - After the entire harvest has been dried our coffee is then transported to Ibagué, Colombia where the coffee is hulled, polished, graded, and sorted. Large machinery removes the parchment layer from our wet processed coffee. The coffee is then polished and any skin that remains on the beans after hulling is removed by machine. 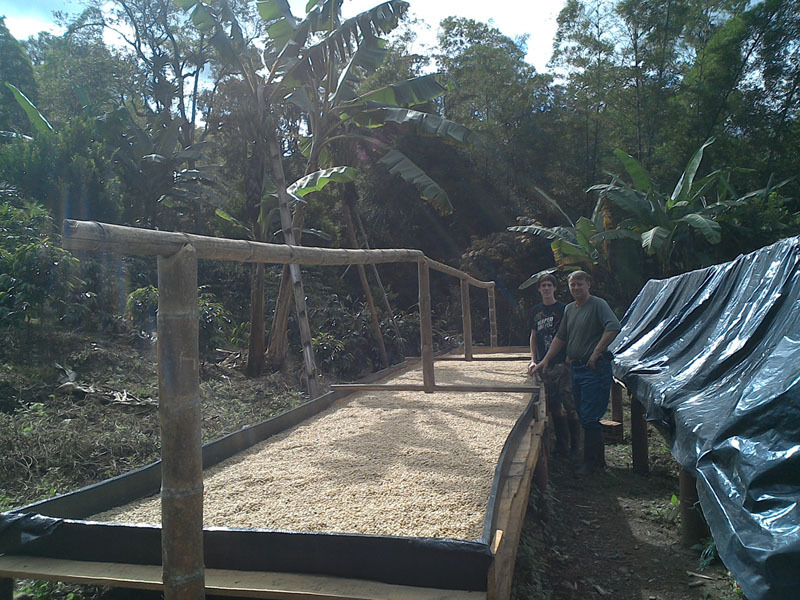 The beans are graded, sorted by weight, and reviewed for flaws and imperfections. Beans that are unsatisfactory due to defects (unacceptable size or color, over-fermented beans, insect-damaged, unhulled) are removed by machine to ensures only the finest quality coffee beans are exported. The milled beans are now referred to as green coffee and are transported to the port of Cartagena, Colombia and loaded into a shipping container on a cargo ship in 77 lb jute bags. The coffee then arrives in the port of Baltimore, Maryland and is shipped by rail to South Bend, Indiana where it is then freighted to our roasting office in Linn, WV. 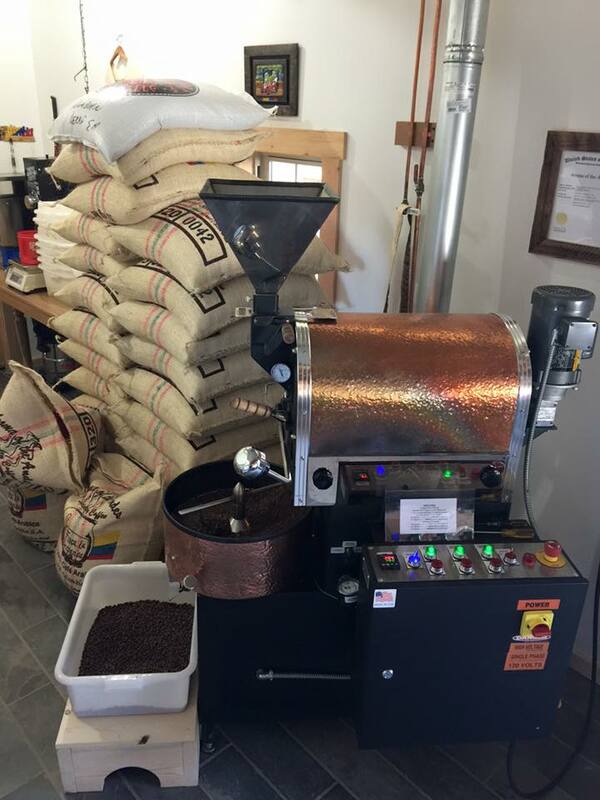 13 - Roasting transforms green coffee into the aromatic brown beans purchased in our favorite stores and cafes. During roasting, the characteristic coffee taste and aroma is formed, along with the typical brown color of the beans. By varying roasting conditions, it is possible to achieve the specific flavor profile of the final coffee depending on the preferences of the consumer. Green coffee beans are heated to between 400°F and 480°F for 15 to 25 minutes. Longer roasting generates a darker color and more intense aroma and flavor. Following roasting, the beans are cooled to room temperature. They are then packaged as either ground or whole beans according to their intended use (which will also influence the taste in the cup). Roasting occurs in the importing country because freshly roasted beans must reach the consumer as quickly as possible. Roasting transforms green coffee into the aromatic brown beans that we purchase in our favorite stores and cafes. During roasting, the characteristic coffee taste and aroma is formed, along with the typical brown color of the beans. By variation of the roasting conditions it is possible to achieve the specific flavor profile of the final coffee according to the preferences of the consumer. Green coffee beans are heated to between 400°F and 480°F for 15 to 25 minutes. Longer roasting will generate a darker color and more intense aroma and flavor. Following roasting, the beans are cooled to room temperature. They may then be packaged as whole beans or ground for their intended use which will also influence the taste in the cup. Roasting occurs in the importing country because freshly roasted beans must reach the consumer as quickly as possible. 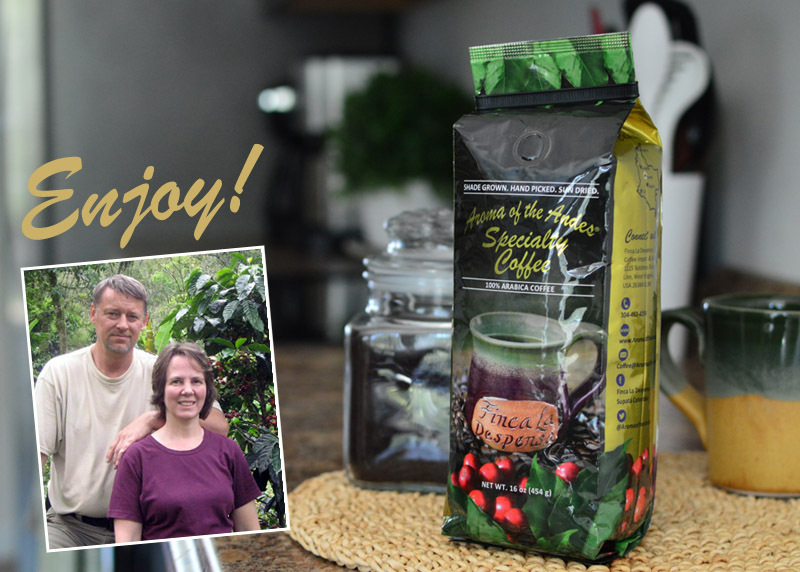 Aroma of the Andes is owned and operated by the Brown Family. Their coffee farm, Finca La Despensa, is located in the Andes Mountains of Colombia, South America outside a small town called Supatá. 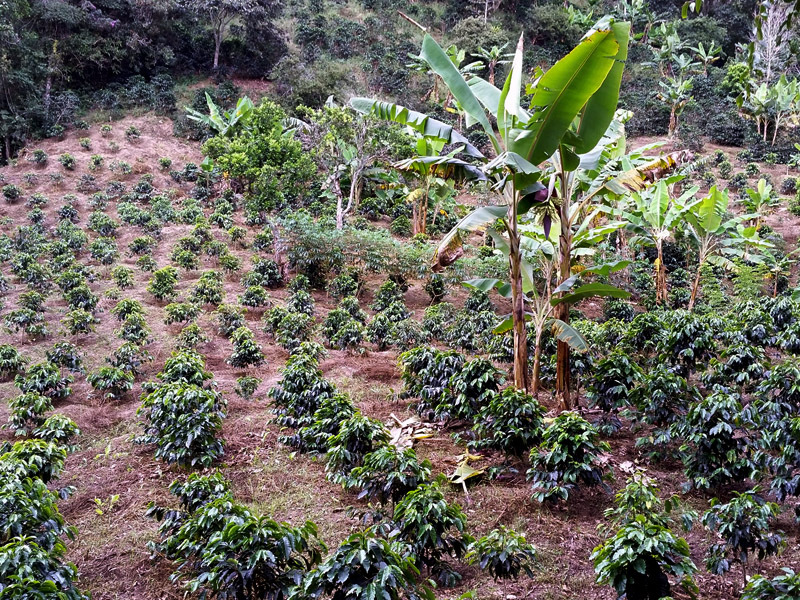 There they grow 6,500 environmentally friendly coffee trees. Enjoy shade grown, hand picked, sun dried coffee you will love!